While it’s officially no longer Summer in the UK, there’s no need to miss out on the things we love about the hot season, and that includes ICE CREAM! Of course, this recipe isn’t the usual sugar and artificial ingredient – filled treat. It’s simple, healthy, and thanks to the main ingredient of bananas, it’ll help to boost your mood, provide plenty of energy, and can also help to lower blood pressure due to the high levels of potassium. Tryptophan is plentiful in bananas, and is the precursor to the feel-good neurotransmitter serotonin, which means eating a banana a day can help prevent the winter blues from setting in as we move closer to the colder months. Pure maple syrup has a lower glycemic index than honey or dates, meaning it won’t cause your blood sugar levels to spike like many other natural sweet ingredients would. Lucuma powder is also used as an optional way to sweeten this recipe, and is a natural super food containing good levels of potassium, sodium, calcium and magnesium. Cacao provides more mood-boosting benefits, and acts as a pretty powerful antioxidant, while vanilla extract helps to lower levels of anxiety and stress. So an ice cream that will actually help to lower stress levels, while increasing your mood and energy…. And there’s only five ingredients! After a few hours you can stop stirring (hurray!) and either leave the ice cream until you want to eat it later, or have a scoop immediately, just to make sure it tastes right…. 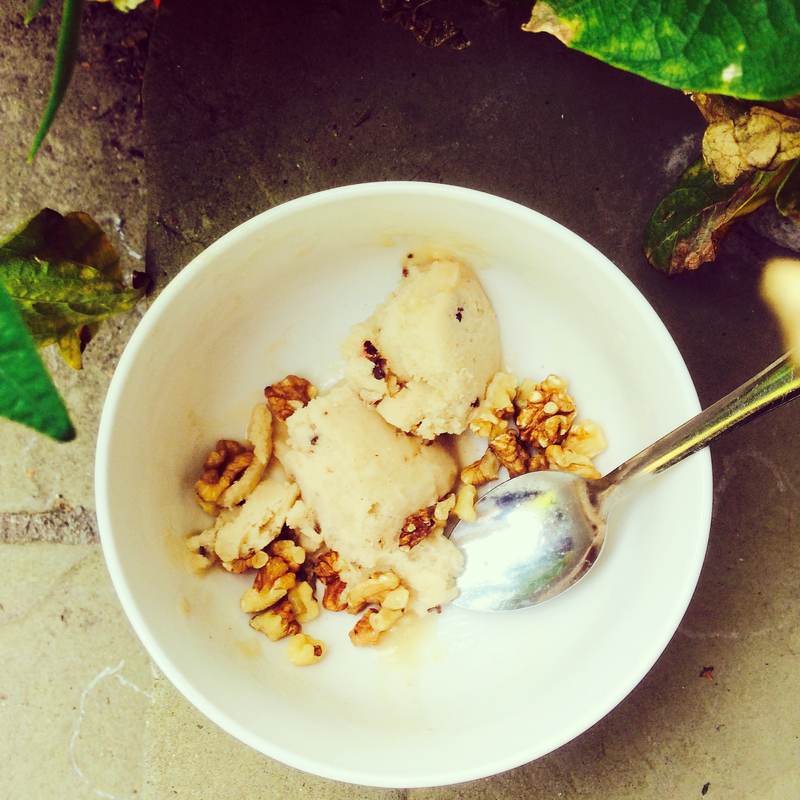 This ‘nice cream’ is great served with walnuts, adding in healthy fats and protein and more mood-boosting benefits. Remember that every treat we give ourselves should actually treat us. Natural, whole ingredients are a real treat for the mind and body… So the next time you’re craving ice cream, maybe choose to opt for the choice that will really benefit you on every level and help you to stay happy and healthy!